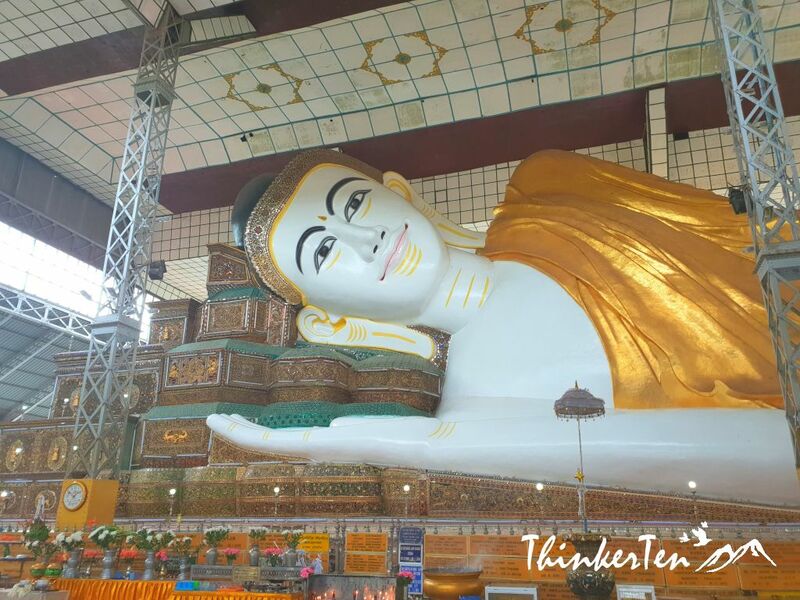 There are two reclining Buddha in Bago, one indoor and one outdoor. The one indoor is called Shwethalyaung Buddha. 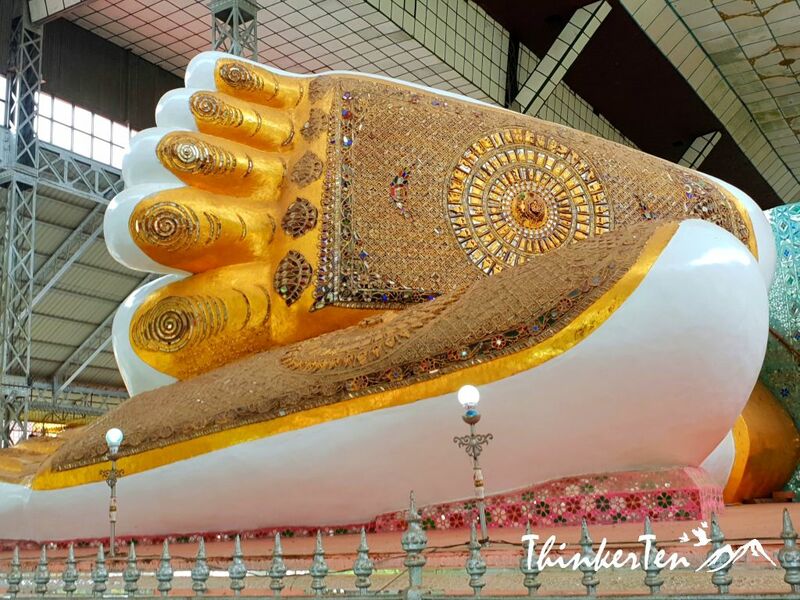 Shwethalyaung Buddha is measuring 55 meters long and 16 meters high, slightly shorter by 10 meter compared to the famous Chauk Htat Gyi Buddha, the other reclining Buddha located in Yangon city. In total, I have seen 3 reclining Buddha during my visit to Myanmar. 2 in Bago city and 1 in Yangon city. Shwethalyaung Buddha was built by the Mon King Mgadeikpa in the 10th century and only rediscovered until 1881 when the workers unearthed it while building the Yangon Bago railway line. The Shwethalyaung Buddha was actually partly destroyed in 1757 and was under the cover of jungle growth. 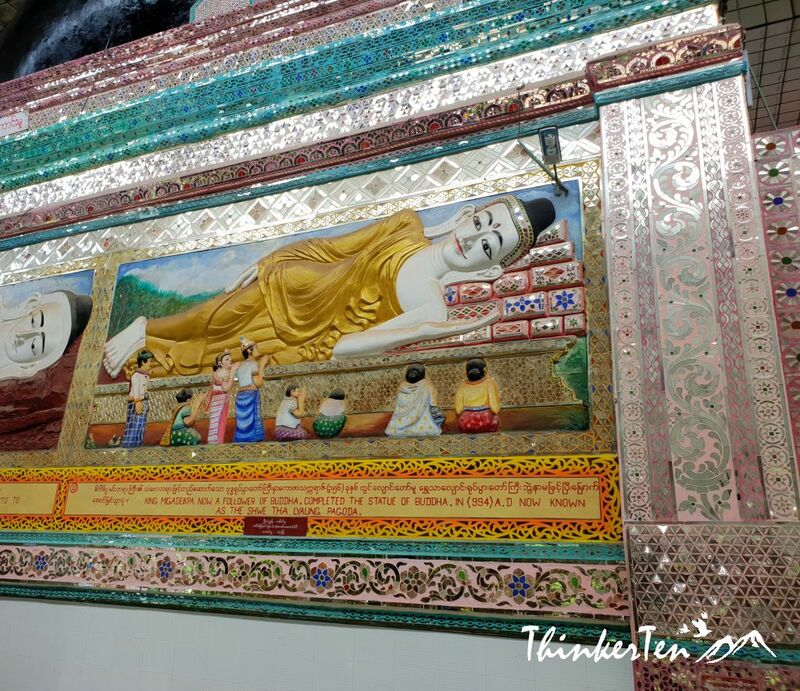 Beautiful mosaic stones was used and added to the pillow on which the Buddha’ head rests. The temple complex is not big, as usual no shoes, no socks are allowed and no shoulders and knee revealing clothes. There are several murals at the back of the reclining Buddha. 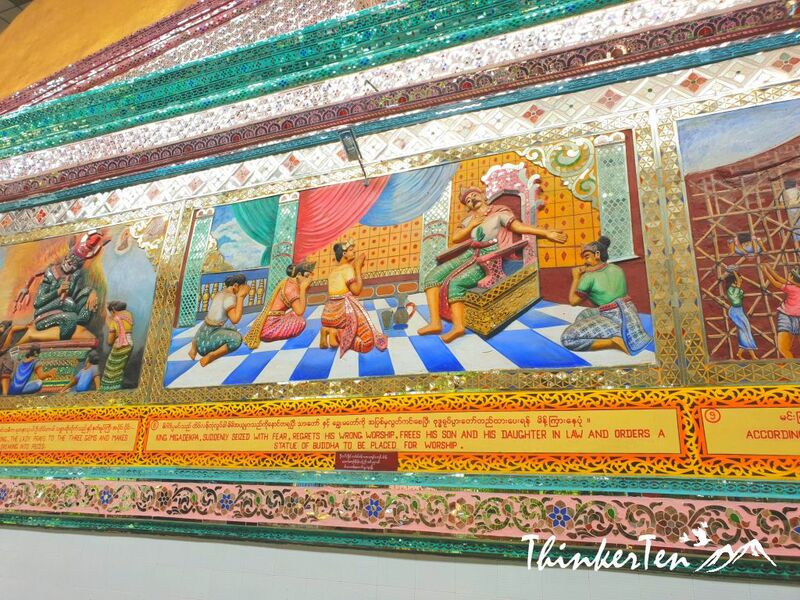 These murals depicting stories of how the reclining buddha came to be. There are English words printed at the mural so you can take your time and read the story. Another highlight not to be missed is the foot of the Buddha which has intricate print and pattern, painted in gold. 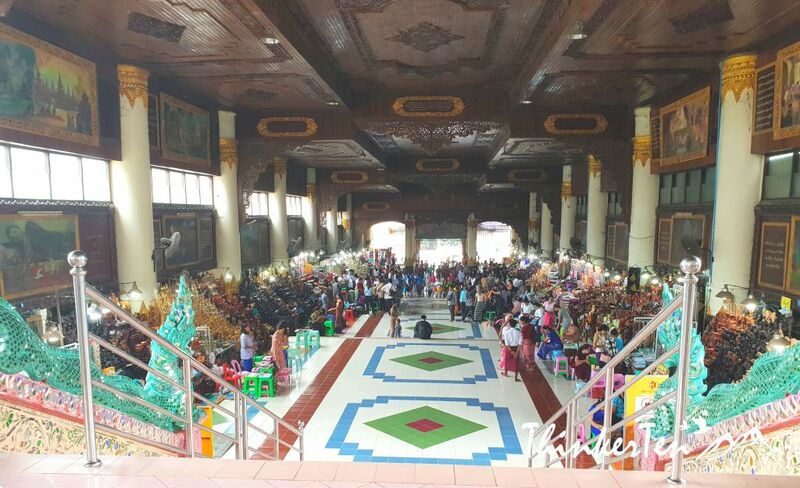 The market souvenir hall is at the entrance way to the Shwethalyaung Buddha, both sides of stalls selling all kind of things, including flowers offering to the Buddha. 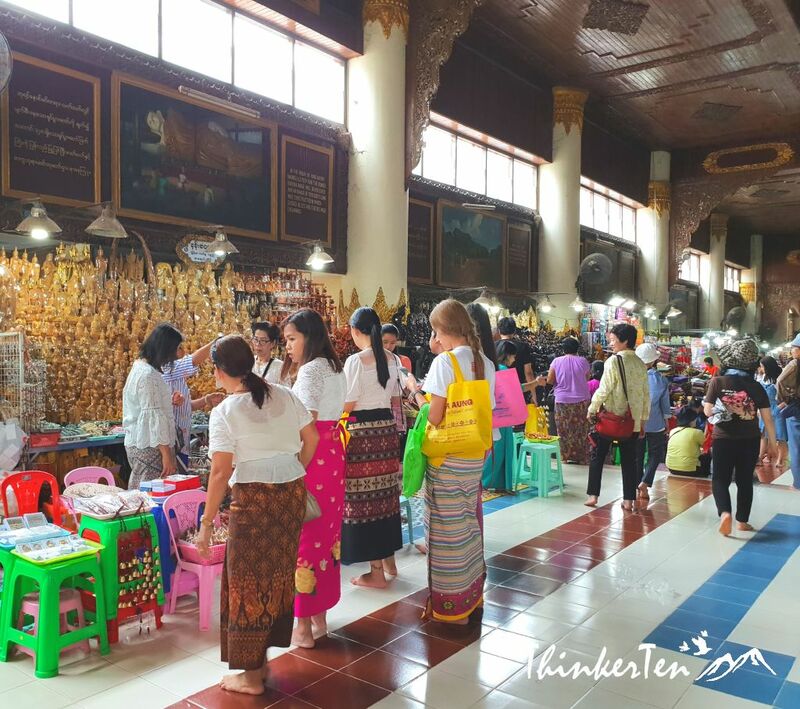 After visiting the Shwethalyaung Buddha you may like to have a look at the souvenirs sold at the market hall. 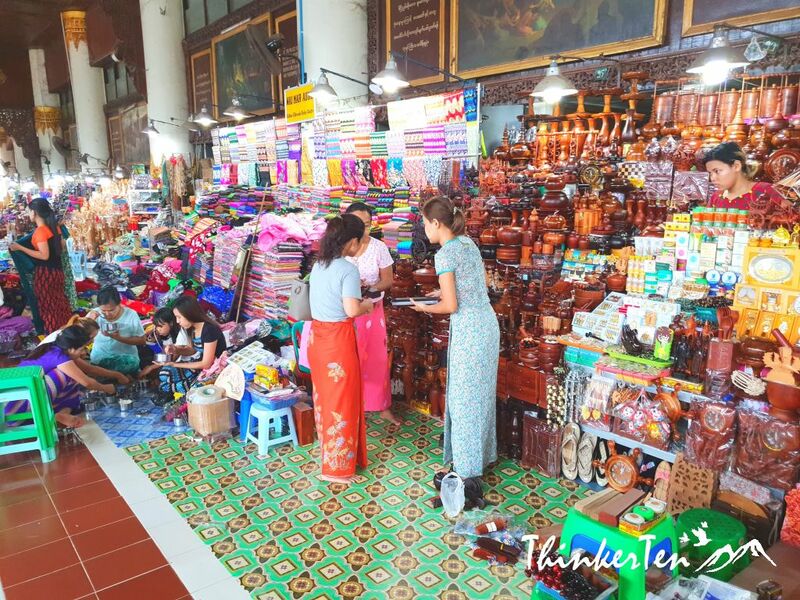 Things sold here are the longyi or sarong (long skirt to wrap around at your waist), Thanaka – the yellowish powder painted in most Burmese faces and many other little trinket. Entrance fee is 10,000 Kyat (USD$10) for 4 historical sites in Bago. Buy Bago archeological zone ticket and visit all the 4 sites located nearby. Shwethalyaung Buddha is one of the site, the staff at the entrance will help you stamp at your ticket before you enter. The other three historical sites are Shwemawdaw Pagoda (Tallest pagoda in Burma), Kyaik Pun Pagoda (Four towering images of the Buddha) & Kanbawzathadi Golden Palace (Reconstruction of King Bayinnaung’s 16th century palace). This is the 4 must see in Bago. In total, I have seen three reclining Buddhas in Myanmar, one in Yangon also the biggest and two in Bago; indoor & outdoor. The reclining buddha in Myanmar look different from the one I saw in Dafo temple in Gansu China few months ago. Over here in Myanmar, the face features are sharper with bright lipstick and dark eyebrows color as compared to the Dafo Buddha in Gansu China. Hence the reclining Buddha in Myanmar look younger and modern. Why there are so many reclining Buddha? It is said that this position represent the historical Buddha during his last illness, about to enter the parinirvana/nirvana after death. Wow! I love how beautiful and colorful everything is! I understand a little bit about the culture, but I’d love to learn more! That is so beautiful! Things like that are why I love to travel. You never know what you’re going to find. I’d love to visit one day. Wow that’s so amazing! So much work must have gone into creating this magnificent place! I’d love to travel there one day – thanks for sharing. Myanmar is one my bucket list and loves big Buddha is stunning! Would love to visit here! You are right, Myanmar is a Buddhist country and the land is full of pagodas and temples. Everywhere you will spot big and small pagodas. However, the reclining Buddha Swethalyaung (indoor) is one of the historical site in Bago city, about 2 hours drive from Yangon. Wow! Everything is almost perfect. I heard them from stranger at Train, they were right almost. It is really beautiful and you know culture within you gets wake up. I quess the stranger in the train should be very proud of the Reclining Buddha so spoke about it. Glad to learn that you have some exposure from the Myanmar culture. It’s pretty interesting to learn other countries culture which can be quite different from ours. Lots of colour, seems like an interesting culture. I would have never known about this! I love when blogs introduce me to cool places that I am unfamiliar with. If I am ever in the area, I would love to visit this! Great to know about the position. That’s such a fascinating place. Would love to visit it someday. What a great story. I´m always amazed of the details and colors of the Buda, the picture of the feet is something else! The Buddha in Myanmar uses lots of gold and the facial make up is brighter, the lip and the eyebrow. Slightly different from the one in China. I love all of the colors! Myanmar looks like a beautiful place to visit. Myanmar is still very backward compared to Thailand and Vietnam in term of tourism. The Myanmar government only open up few years ago so plenty of work such as infrastructure and other amenities are on it way. Wow! This is just stunning – I can imagine that experiencing this in person would be truly wonderful. Thank you so much for sharing! This place looks awesome. I love their culture. Myanmar is a must visit place. This is very detailed article about Bago Reclining Shwethalyaung Buddha. Will save this blog for future. 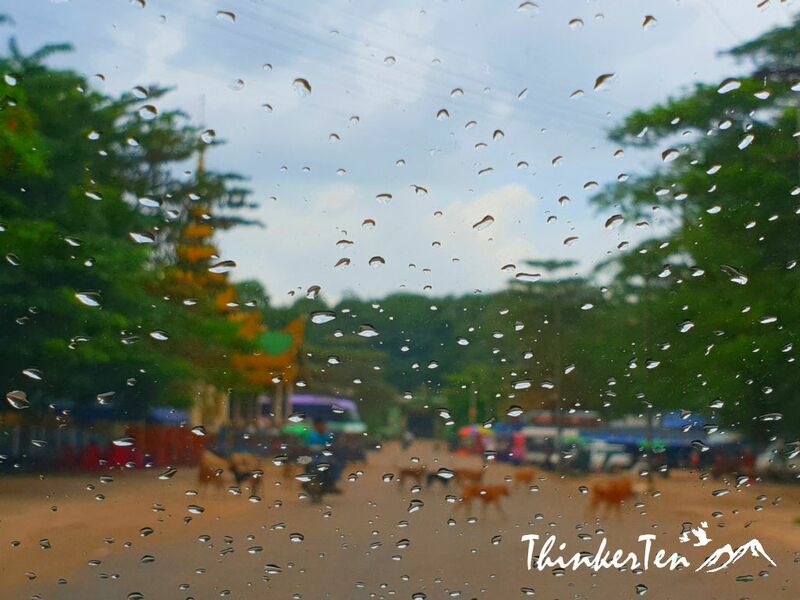 Bago city is an ancient city for Myanmar, just 1.5 to 2 hrs drive from Yangon. Worth to do a day trip and there are several historical site to visit within a day. I have never been in Bago, Myanmar but it looks like a nice place to visit and their architecture designs of their buildings are really gorgeous. I have seen a few reclining Buddha statues during my travels in South East Asia but I never knew the significance of it. The one in Bago looks very impressive and it’s incredible that it dates all the way back from the 10th century. What a neat place to visit. This would definitely be impressive to see in person. Sounds like there is so much to see an learn about. The one thing I realised is the sleeping position is represent the historical Buddha during his last illness, about to enter the parinirvana/nirvana after death. No wonder there are many reclining Buddha all over Asia. It is very interesting to learn about history of a place as it reveals all of the past. We also get to learn about their culture along the way and broaden our horizon. I saw a reclining Buddha in Bangkok. The thing that impressed me the most was his feet. So thank you for showing me the feet of this amazing Buddha. Great post. There are many reclining Buddha in Asia and Bangkok is another top location to check on the reclining Buddha 🙂 Glad you have seen one too. The Buddha feet of the reclining Buddha in Myanmar has intricate pattern and I think it meant something. WOW this is simply magical. would love to see in person! Thank you for sharing. 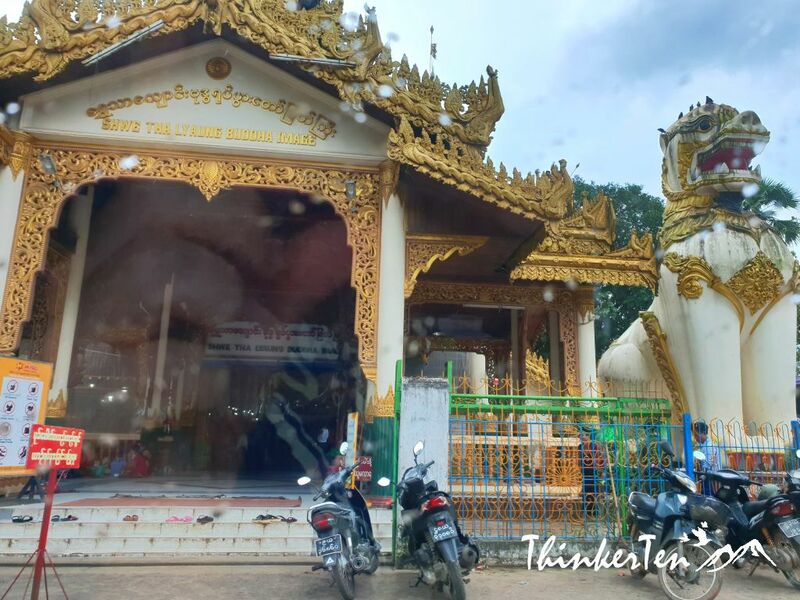 I had no idea about the two reclining Buddha in Bago. 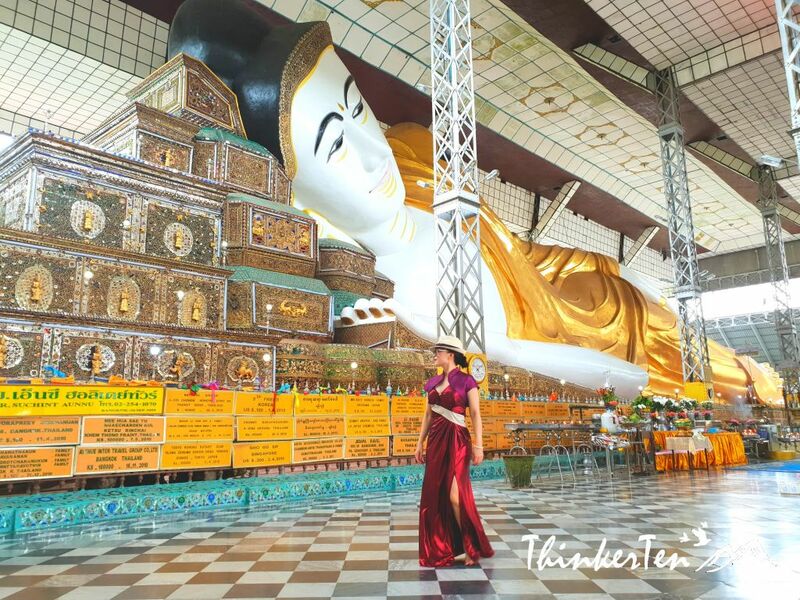 There are two Reclining Buddha one indoor and one outdoor in Bago city. Both are quite close to each other. What a unique and beautiful place! The dress code is a good bit of information to have, but I would love to see it one day! The national dress code for Burmese people in Myanmar are usually Longyi which is a long piece of cloth to wrap around your waist. For many temples & pagoda complexes, a strict dress code is a must – that is no sleeveless and knees must be covered. Well, they may have differences but both Taoism and Buddhism belief in reincarnation which means the life after death and both have similar ultimate goals. Wow! This is beautiful! I would love to see the intricate details in person. Do check on the pillow where the Buddha’s head rested, built with beautiful masaic and the 10 murals behind the Buddha, telling story and history of the Buddha. I have never been to Bago but I always wanted to visit. Such a wonderful place. Bago is a hidden gem near Yangon, about 2 hours drive from Yangon City Myanmar. Most people would do a day trip to Bago city to check out the few historical sites there. I am still wondering how did they actually make it..lying down tilted and of such size, that statue is definitely something epic! Keep exploring offbeat wonderful places like these! 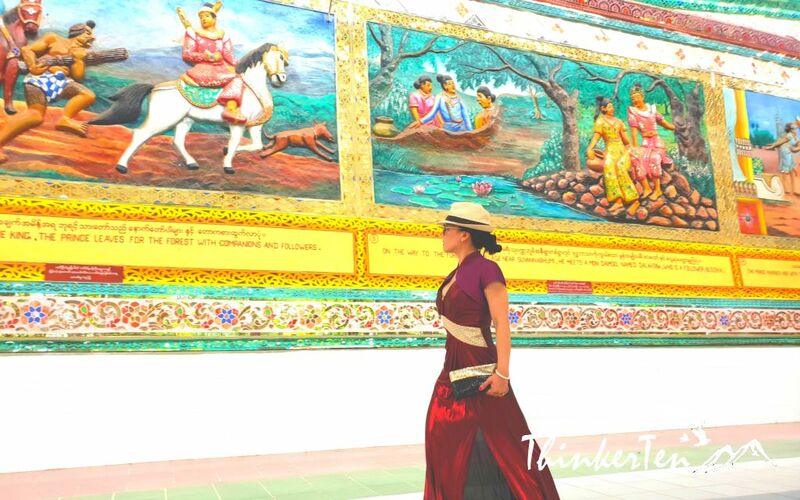 The reclining Buddha was built in 994 but only discovered in 1881 after the British trying to build a railway to connect Bago city with Yangon City. The reclining Buddha was covered by the forest for years. This reclining Buddha is really cool! I have never seen anything like this in my life! There are many reclining Buddha in Asia but Bago Reclining Buddha is one of the historical and well-known one in Myanmar. This looks gorgeous! The reclining buddha is very fascinating. Myanmar is country that is full of culture and history, a little backward compared to its neighboring countries, such as Vietnam and Thailand. The Myanmar Government has recently open up the door for foreigners to visit the country so many tourists has rushed in but the infrastructure and other amenities are still lacking to support the tourist industry. This is nice. Looks like you had fun. Myanmar is one of the country I’m looking forward to visit. Most of my workmates came from that country. I guess you are well exposed to some of the Burmese culture since you mingle with your Burmese workmates. Hope you enjoy their culture and better understand them when you explore Myanmar. This place is absolutely stunning! I am loving all the murals and the pretty colors. I have never been to Myanmar before and your post made me feel like I was right there. Thanks a ton for writing about this! How beautiful and interesting! What an incredible journey! The temple attire is just breathtaking! It is definitely a place you need to go to in a lifetime! I got a chance to briefly visit Myanmar a couple years ago. But I didn’t see this reclining Buddha. I did see the one in Bangkok though– both are beautiful. Asia has quite a few of reclining Buddha and glad that you have seen one in Bangkok. This looks really colorful, very usual for a European Eye. For me, photography is the main thing in traveling and I would love to get to this place with my camera. You have some really amazing photos here! I have never been to Myanmar but would love to! Wow! Myanmar through your eyes looks beautiful. This reclining Buddha reminded me of the Buddha statues in Sri Lanka which we saw recently. I have not yet been to Sri Lanka so would really love to check the Buddha statues there too. So beautiful. I love to travel and bring the kids with me. It’s always a wonderful experience and you never know what you’ll get to see. These are little nuns dressed in pink with shaved heads who gives us blessing. This reminds me the sleeing Budda in Bangkok. It made a huge impression on me. The place you mention looks similar, very decorative. I really like your pictures and the dress you are wearing is so pretty. Wow built in the 10th century? That is truly amazing and I can’t even Imagine. The reclining Buddha get discovered in the forest when the British built the rail track from Bago to Yangon. Wow the colors here are so vibrant! I bet this is a stunning sight to see in person! Great photos too! The make up of the reclining Buddha are really bright color which look different from the reclining Buddha in China. China reclining Buddha has more natural make up, no dark eyebrow and no blue eye shadow and no red lipsticks like the one in Bago Myanmar.